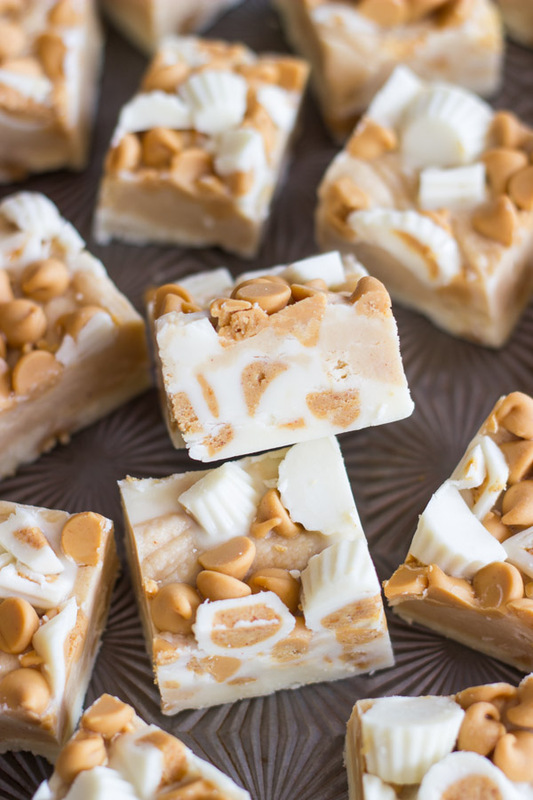 Ready in minutes, this white chocolate fudge is loaded with peanut butter cups, peanut butter chips, and what else – peanut butter! 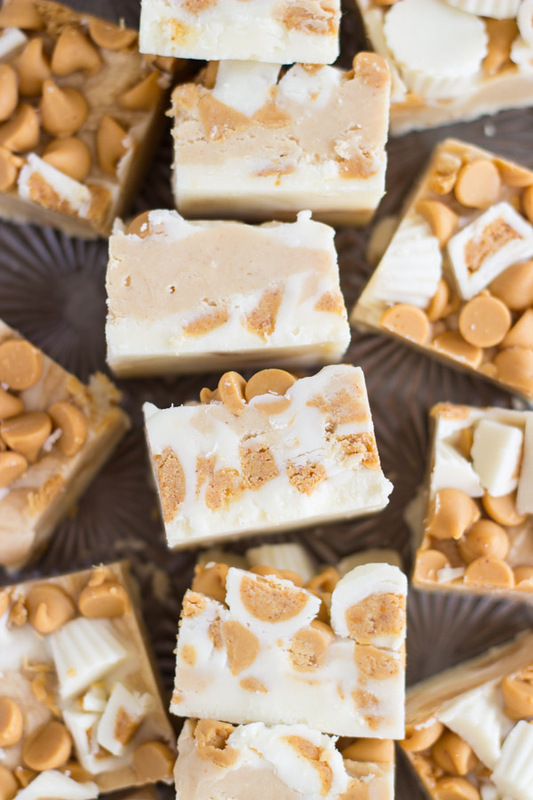 This White Chocolate Peanut Butter Cup Fudge is as easy and decadent as it gets! 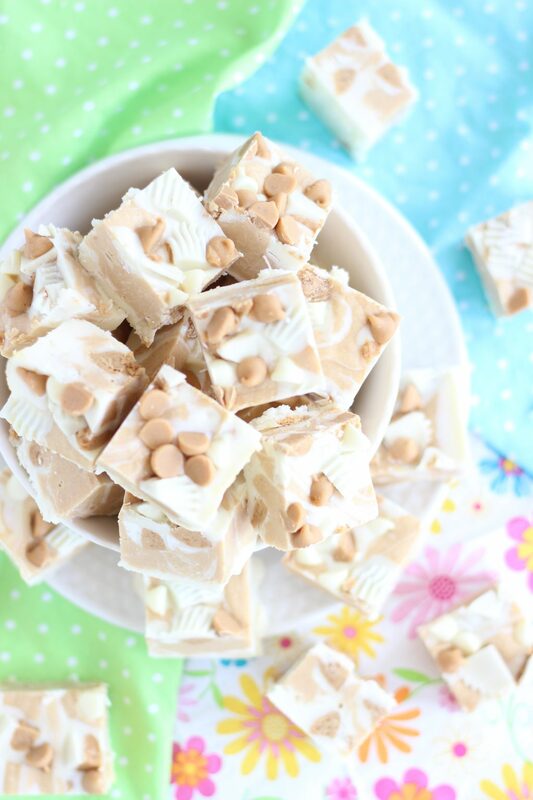 Yes, yes, another fudge recipe. And, yes, it’s another frosting fudge variation. But hear me out: you can never have too many quick, no-bake recipes. 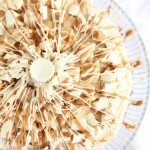 And my 5-10 minute prep-time frosting fudge recipe is so versatile. 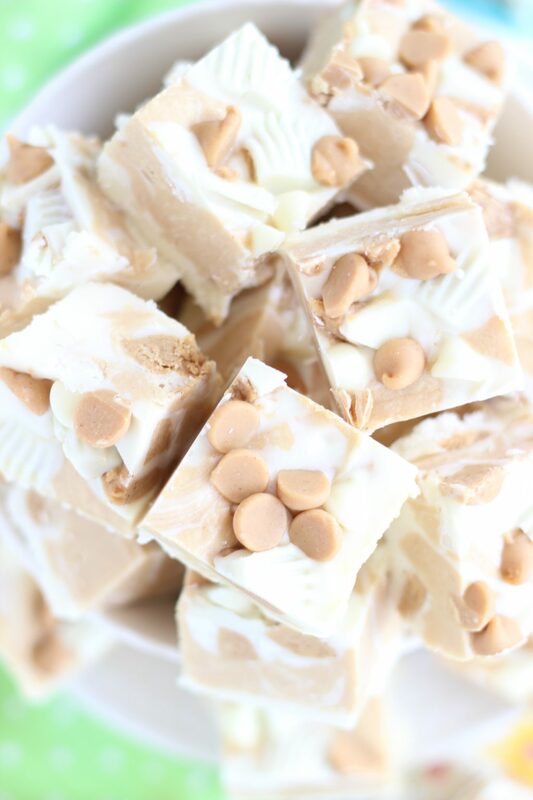 Any flavor fudge, any flavor chips, any mix-ins you want… you have limitless possibilities. 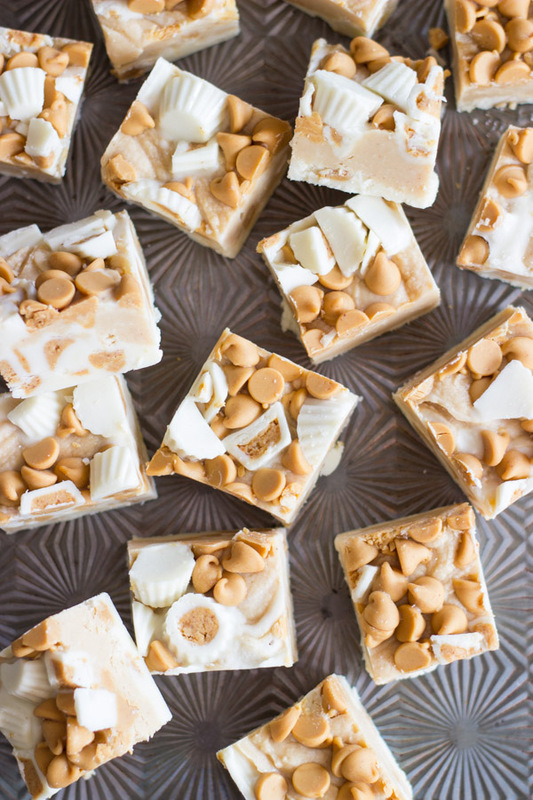 I have almost a dozen variations on frosting fudge, even a Pina Colada Fudge that contains shredded coconut, dried pineapple, macadamia nuts, and maraschino cherries. That’s just how creative you can get with it. It’s a secret weapon recipe. It customizes easily, and it’s legitimately very quick and simple. You need a dessert in a pinch? 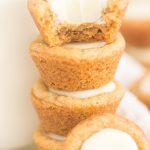 You can choose from one of many frosting fudge recipes that I’ve shared, and dessert is ready in minutes. I’m not exaggerating how little time you need for this fudge – it’s speedy. 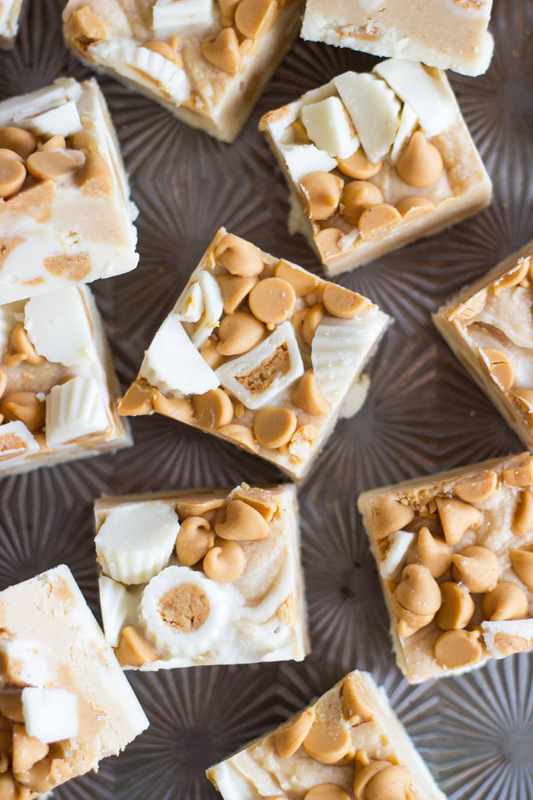 Prep time is super short, and you can set this fudge quickly in the refrigerator. 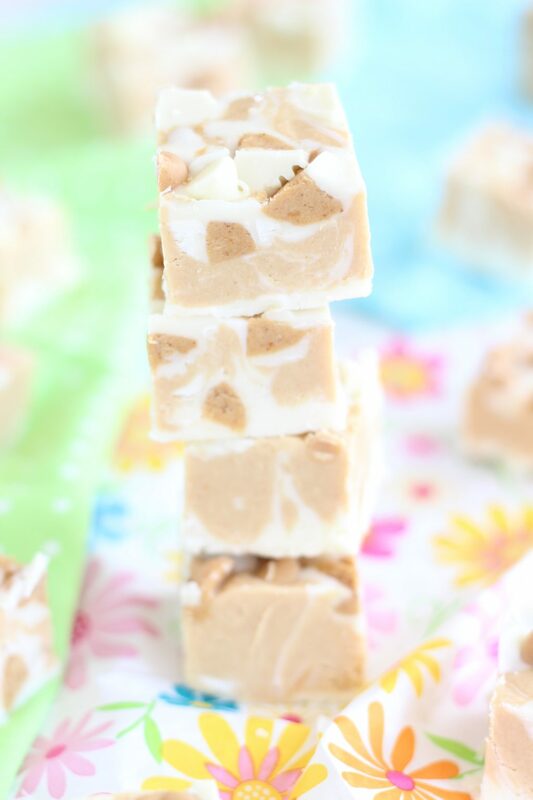 I’ve already raved and raved about how much I love white chocolate and peanut butter together, so I’ll spare you another round of that, but this 10-Minute White Chocolate Peanut Butter Cup Fudge is basically the ultimate in white chocolate and peanut butter decadence. If you love those two together, and I most certainly do, then this is the fudge for you. 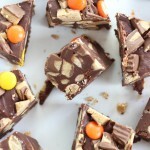 If you prefer regular chocolate with peanut butter, well, I have a fudge for that too. 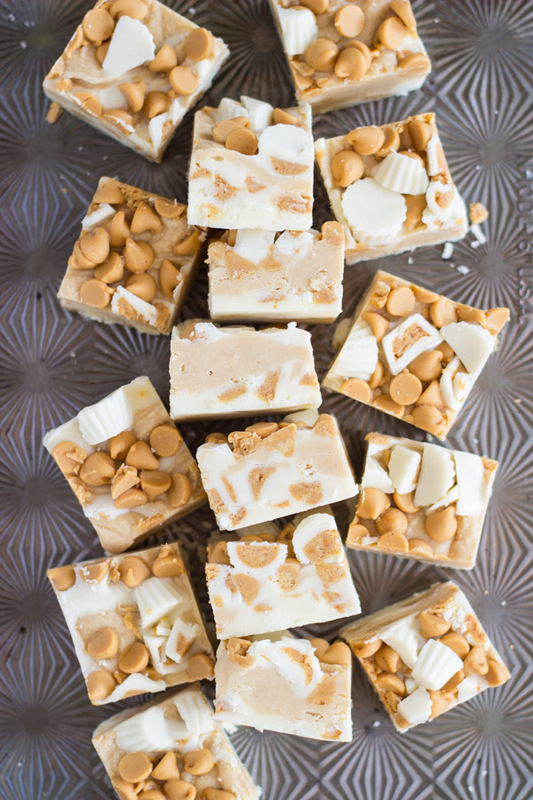 This White Chocolate Peanut Butter Cup Fudge starts with prepared plain white frosting, and white chocolate chips, melted together with a little butter. 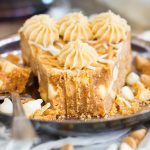 We’ll swirl peanut butter right into the fudge batter, as well as an entire pound of chopped white chocolate Reese’s cups. 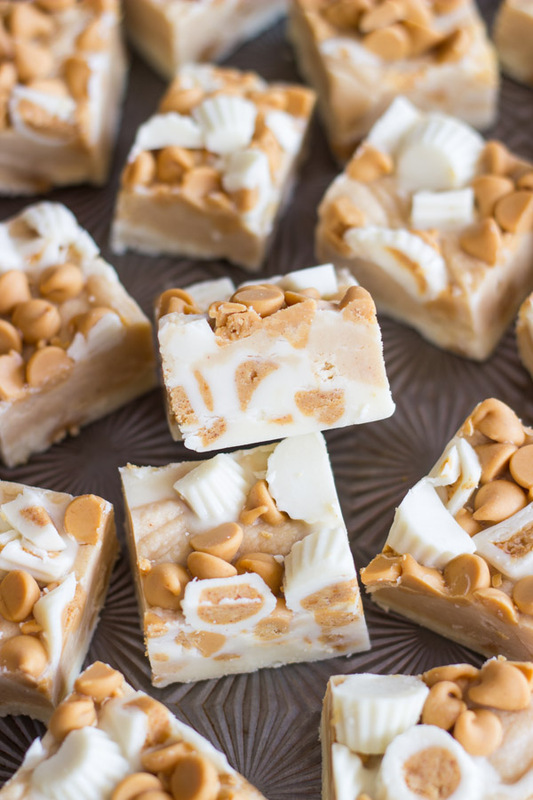 Topped with white chocolate chips, peanut butter chips, and more white chocolate Reese’s cups, there is white chocolate and peanut butter crammed into every nook and cranny of this fudge. 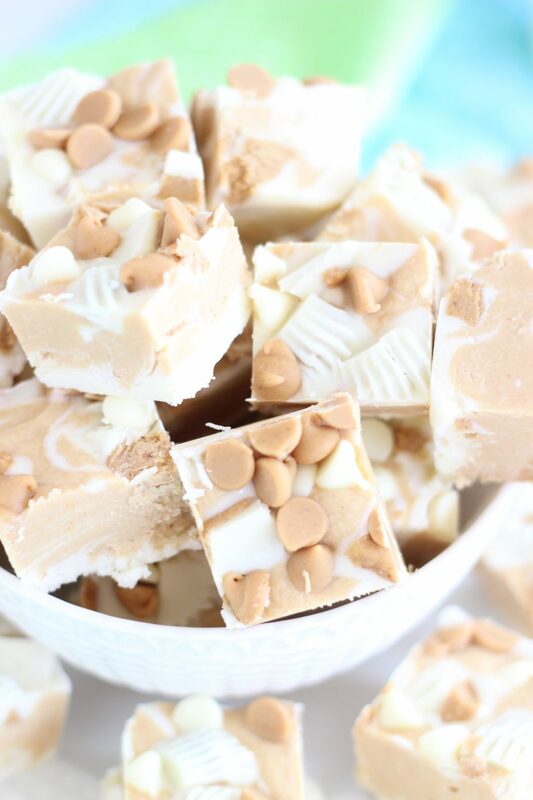 This White Chocolate Peanut Butter Cup Fudge recipe is definitely one of the sweeter fudges I’ve ever made, and you are going to need to really love sugar, so make sure you’re feeding a crowd of serious sweet-tooths. 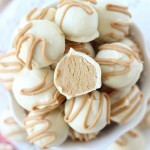 But any peanut butter-lover will enjoy this super easy candy! 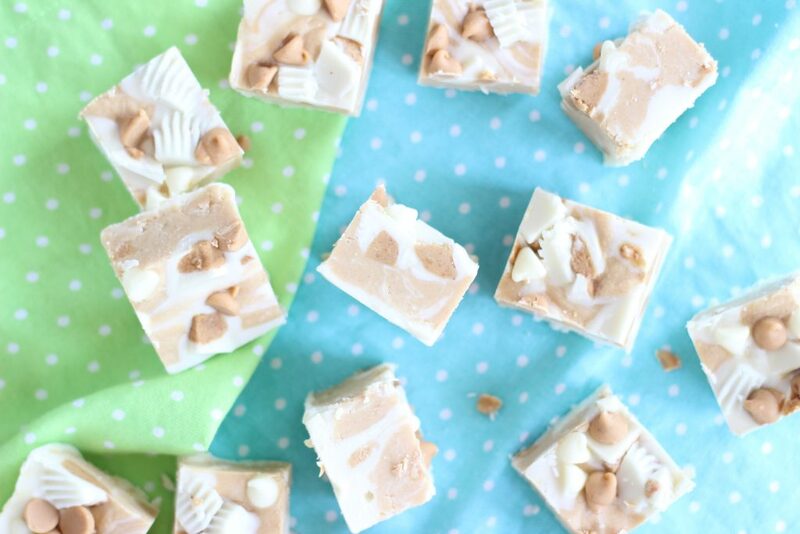 And when you get loads of peanut butter cups, Reese’s pieces, and even just chocolate bars for Halloween, you can make this White Chocolate Peanut Butter Cup Fudge to use up all that candy stash! I’m such a lover of both of these flavors that I know I’d love this fudge!